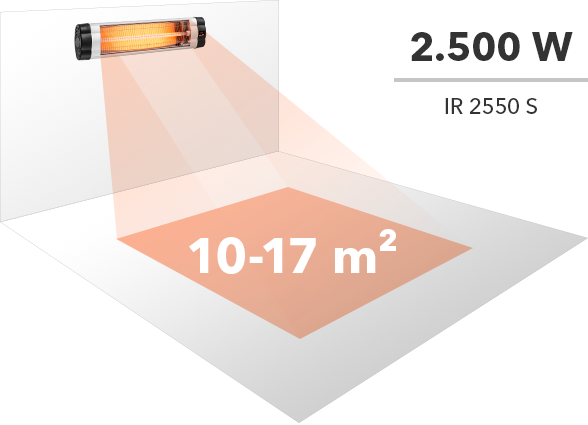 With its enormous power of 2,500 watts the radiant heater IR 2550 S provides soothing warmth even in the coldest of corners. The powerful radiator can also be a clean and silent heat supplier for the catering sector promoting the customer satisfaction on outdoor terraces. For the device can be flexibly applied outdoors and owing to the inclination angle that is adjustable by 90°, the generated heat can be directed precisely at the guests' tables. This allows you to extend mild summer nights on your terrace at home and to enjoy sitting out of doors even in the time between seasons. With the IR remote control handling the infrared radiant heater is not bother at all: You can switch the radiant heater on and off, choose from among the three heating levels and set the 24-hour timer – all at the push of a button. In addition to "Off" , the device offers three heating levels (850 W, 1,650 W and 2,500 W). Evidently, all functions can also be controlled via the control panel of the IR 2550 S – one look at the integrated LED display tells you which heating level has been selected. The infrared radiant heater can quickly and easily be attached to wall, ceiling or telescopic tripod – for start-up the connection cable of the device is simply plugged into the nearest socket. Owing to its compact design the IR 2550 S is also ideally suited for use in larger spaces such as in marquees, sidewalk cafés or stables. If the infrared radiant heater is mounted to the ceiling or some other poorly accessible location, the remote control can be used to switch the device on or off comfortably. The IR 2550 S yields warmth following the natural principle of the sun. Infrared radiation immediately generates an agreeable sensation of warmth on the skin. A great deal of the energy input is converted directly into heat, which in comparison to a hot air blower increases the performance of the quartz radiator in terms of energy-efficiency. Seeing as the device further gets by without fan, it can supply the heat without generating odours, noise or raising dust. Which recommends the radiator as heating solution for allergy sufferers. 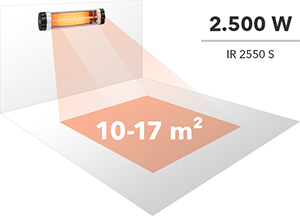 With a width of 870 mm and up to 2,500 watts of power the IR 2550 S can provide infrared heat for a great number of possible applications, yet requires no warm-up time. Simply mount the infrared radiant heater to the wall, to the ceiling or to a telescopic tripod. The device can be controlled via the remote control. The infrared radiant heater is equipped with an LED display with three selectable heating levels, indicator light and timer function. Ideal for events and private functions: Mounted atop tripods these heat sources can be positioned flexibly outdoors as needed. The IR 2550 S can also be used as additional heat source in a horse stable – a good idea for steed and equestrian. The infrared radiation generates an agreeable sensation of warmth on the skin, very much like sunlight does. The best thing about summer? The long evenings spent on a terrace. In the time between seasons nights can be rendered more agreeable for sitting outside by the use of infrared radiant heaters.